Check out this beautiful new colorway of Kathie Olivas’ Bobbi the Cat resin figure! The Snowflake Edition Bobbi was cast in rotocast resin and then hand painted by Olivas with oil and acrylic paints. I love the way the pink and orange paint really pops on Bobbi’s white body. Each figure stands 6” tall and features one point of articulation (at the head). 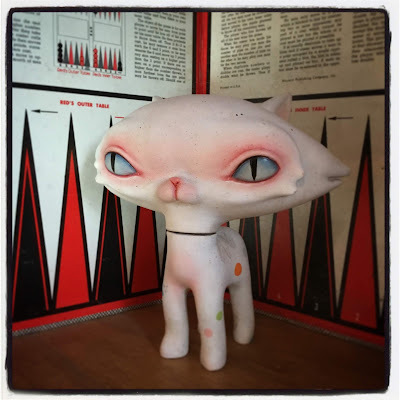 Limited to just 13 pieces, collectors can purchase the Snowflake Bobbi resin figure by Kathie Olivas now at the Circus Posterus online store for $225.